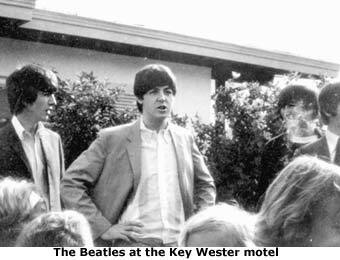 September 10, 1964 was an exciting day for Beatles fans in Key West. It was on this day that the Fab Four flew in from Montreal to take a rest stop. They were originally supposed to stop in Jacksonville but according to The Beatles Ultimate Experience due to Hurricane Dora off of the northeast coast of Florida the flight was detoured to Key West until Hurricane Dora passed. At this time the South was still segregated and this included Florida. The Beatles refused to play the Gator Bowl if the audience was segregated on race. It was promised that the audience would be desegregated and the performance remained on the books. Their hotel in Jacksonville was another matter though. It seems that desegregating the hotel while The Beatles were present could not be worked out. It was rumored that this is the real reason their rest stop was moved to Key West. While in Key West reporter Jean Morris was able to interview them. After some questions about Rolling Stones and who was married and who was single the subject came around to eating. directly about it tried to not make a big deal about it by saying they had no control of booking rooms or the cancellation of them. Jean Morris does not ask them to elaborate. 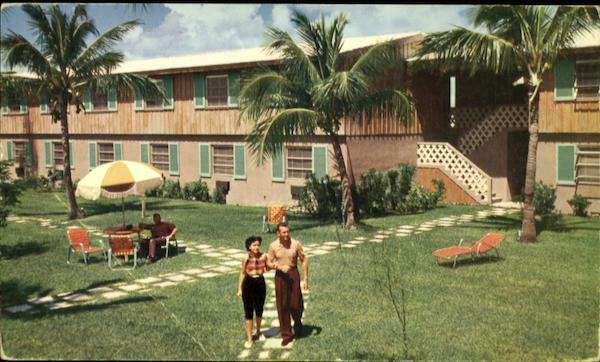 The Key Wester Motel was demolished in 1999 and was replaced by the Hyatt Windward Pointe. The Hyatt Windward Pointe Hotel, according to the Beatles Bible , an open-air structure named the Beatles Hut commemorates the place where the group stayed. While there they jammed with rhythm and blues singer Clarence “Frogman” Henry, The Bill Black Combo, and The Exciters, who are from New Orleans and local musician Coffee Butler. While their concert at the Gator Bowl was canceled due to Hurricane Dora the game was still played. It was Florida State v. Oklahoma. The final score was Florida State 36 Oklahoma 19. The details of the game can be found here and here. That was so interesting to read. And it’s wonderful that they refused to play if the stadium was segregated. I was very surprised as well. I couldn’t find any information on whether they segregated later because the Beatles had to cancel their concert there. I’d never heard this story, but given the group’s admiration and respect for the old R&B guys, it doesn’t surprise me that they wouldn’t play to segregated audiences. I also interviewed the Beatles at the Key Wester. I was a high school student attending Mary Immaculate High School and it turned out, I was the only student granted an exclusive interview with them during their US tour. Thanks to their press manager, Derek Taylor, I interviewed John Lennon for over an hour, I was invited back and interviewed Paul, then George and rode in the limo to the airport in Key West with Ringo. The Key West paper interviewed me as a result! An amazing experience for a 17 year old, to say the least! Do you still have a copy of your interview? I would love to read it. That is so cool that you had that opportunity. That is hilarious. Do you have a link or reference to this story. I could totally see this happening. I went on a “mini train” tour of Key West, driving past all the tourist spots. The guide told that story during the tour as we passed the hotel. I just stayed at the Hyatt Windward Point for the past 5 days! What a beautiful view and condo resort! The bar at the pool is Abbey Road and there are pictures of the Beatles that were taken when they stayed there! The entire resort is named in relation to the group. I called down to the front desk to reserve a grill and I was assigned George! Each grill is named after a Beatle! How cool! I worked as a night auditor at the Key Wester in 76 and 77. Never heard the story until now. I was a country musician at the time of the beatles visit. working at the golden nugget on duval street. owner- ida caplan (miss Ida) with my brother ted alsup-guitar-corky tittle drums-and me Harley alsup on guitar. we made it to the airport when the beatles landed, but the crowd was too much, so we headed back to the nugget to finish the night..Harley alsup.